After the breakup of the Soviet Union in 1991, newly independent Ukraine was left with some significant space assets from which to buildÂ a national program. Ukrainian companies build the Zenit, Cyclone and Dnepr launch vehicles that are used for satellite delivery. The nation also recently shipped the first stage for Orbital Sciences Corporation’s new Taurus II rocket.Â Ukrainian companies contribute to the construction of Russian Soyuz and Progress vehicles, which ferry crews and supplies to the International Space Station. Ukraine also has the capability of building satellites and defense systems and has ground receiving stations. The National Space Agency of Ukraine under Dr. Yuriy Alekseyev oversees the country’s space efforts.Â Although overshadowed by its larger Russian counterpart, Roscosmos,Â the NSAU is building on its Soviet-era foundation in an effort to become a force in international space.Â The agency has continued to move forward despite funding difficulties, a global recession, and the bankruptcy of the Sea Launch consortium that uses the Zenit rocket. The nation, whose commercial space industry totaled $254 million in 2009, remains heavily dependent upon the Russian market although it is making major efforts at increasing its international cooperation and standing. Business is looking up as there areÂ increased orders from Russia, a joint launch project with Brazil getting underway, the potential of new rocket development work with Kazakhstan, and the emergence of Sea Launch from bankruptcy with a new Russian majority owner. Russian officials also recently announced the possibility of a Ukrainian astronaut flying to the International Space Station. Ukraine is also pursuing integration of its space efforts with Europe and has formed cooperative programs with China, Japan and Saudi Arabia in the past year. NASA Deputy Administrator Lori Garver had a meeting earlier this year with NSAU officials, although no specifics were released. An overview of Ukrainian’s space effort follows. The coverage begins with a press conference held by NSAU’s leadership in April in which they provided information about the state of the industry and their outlook for the year ahead. Later sections involve a country-to-country look at cooperative projects. All information is based on NSAU press releases unless otherwise noted. On April 14, 2010, the Information Agency “Ukrinform” held a press conference of NSAU Director General Dr. Yuriy Alekseyev and Deputy Director General Mr. Eduard Kuznetsov on the main results of space activities in Ukraine in 2009 and plans for 2010. As previously announced on the press conference, in 2009 space industry produced commercial products in the amount of 2.1 billion UAH [$254.3 million]. In terms of financial crisis the ratio of output in 2009 amounted to 82.3% to the appropriate volume last year and was better in comparison to this indicator in the whole industry of Ukraine (78.1%) and mechanical engineering (54.9%). Increased volume of production for export was 53% of total production (in 2008 – 47%). The export-import balance of space industry was improved; export exceeded imports by factor of 3 in 2009. The average monthly salary rose by 7.3%, and 8 enterprises demonstrated the top salary indicators among the average throughout Ukraine. 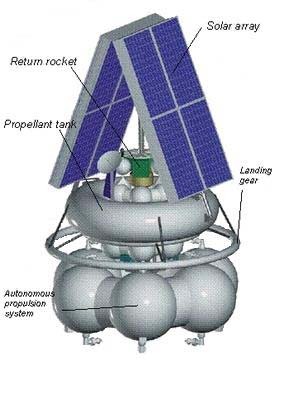 In 2009 six launches of Ukrainian LVs were conducted, delivering 11 space crafts into orbit. In the area of developing the coordinate and time system and navigation support of Ukraine and the formation and experimental operation of ground segment of 12 correction control stations and navigation field reserve control centers was provided. In compliance with the agreement with Orbital Sciences Corporation (USA), the production and testing of assemblies, units, systems of first stage for launch vehicle “Taurus-IIâ€ was initiated. Priority partners of international cooperation in 2009 were Russia, China and India. Framework Agreement between the Cabinet of Ministers of Ukraine and the Council of Ministers of Belarus on cooperation in the exploration and peaceful use of outer space. The number of important agreements on the establishment and development of cooperation in the field of space activities with ESA, Canada, and Germany was reached. Cooperation with Mission Control Center and German Remote Sensing Center was initiated, including the joint use of ground infrastructure and the rapid exchange of data in emergency situations. UKRINFORM. The budget request of the National Space Agency of Ukraine for 2010 equaled to 200 million UAH [$25.2 million] for implementation of the National Space Program. This figure was announced by NSAU Director General Dr. Yuriy Alekseyev at today’s press conference. According to him, NSAU also requested budget financing of 270 million UAH [$34 million] for disposal of solid rocket propellant at Pavlograd Chemical Plant (PHZ). Y. Alekseyev also noted that in 2008 space industry received 223 million UAH [$28 million] and 236 million UAH [$29.7 million] for implementation of the space program and rocket propellant, respectively. At the same time, in 2009 propellant disposal was funded at the level of 87 million UAH [$10.9 million], and space program activities in the amount of 82 million UAH [$10.3 million]. “It was a colossal funding collapse for these programs. You cannot play with propellant like that,” said Yuriy Alekseyev. He also said that NSAU has received appeals from the workforce of PHZ, city and regional administration concerning the situation with solid rocket propellant disposal. According to Yuriy Alekseyev, if this program will be funded, then starting from the 4th quarter industrial propellant disposal shall be initiated. During this period, 6 engines of RS-22 missile were disposed on an experimental unit. RBK-Ukraine. Space industry enterprises, servicing Russian orders will increase production in 2010-2011 by 20%. These figures were announced by NSAU Director General Dr. Yuriy Alekseyev at the press conference. “The volume of Ukraine’s space industry production has been always targeted in 75-80% at Russia. Today this trend continues. We expect growth in the output to 20% of our instrument engineering enterprises in 2010-2011, e.g. â€œKyivpryladâ€ and Kharkiv â€œKomunarâ€ plant. It is concerned that this year will be the last year of “Shuttle” flights and the entire weight of servicing the International Space Station will be laid on Russiaâ€™s shoulders â€“ â€œSoyuzâ€ and â€œProgressâ€ space vehicles. We are participants in equipment manufacturing process for these vehicles, so due to the fact that number of manned and transport flights will increase â€“ these two plants will receive additional volumes of production orders from Russia “, â€“ said Yuriy Alekseyev. He also noted that by 2015, 10-11 â€œSoyuzâ€ and â€œProgressâ€ space vehicles should be developed, which guarantees the production volumes for “Kyivpryladâ€ and â€œKommunarâ€ enterprises. UKRINFORM. This year five launches of “Dnipro” LV and two of â€œZenit-3SLBâ€ LV within the Land Launch program are scheduled, as reported by Director General of the National Space Agency of Ukraine Dr. Yuriy Alekseyev. Two launches for the benefit of the Russian Academy of Sciences will be conducted under “Land Launchâ€ program. Among five of the planned launches one launch of â€œDneprâ€ LV has been already conducted in early April. Meanwhile, Yuriy Alekseyev said that because of the declared bankruptcy of Sea Launch Company, the launches of â€œZenit-3SLâ€ LV will likely resume next year. Ukrainian News. The National Space Agency of Ukraine (NSAU) expects a resumption of the international Sea Launch Company in 2011as reported by NSAU Director General Dr. Yuriy Alekseyev at the press conference. “Next year, Sea Launch will resume its work,” he said. According to him, this company is actively seeking for the foreign investors. Alekseyev also said that shutting down the “Sea Launchâ€ program has significantly affected the activities of â€œYuzhmashâ€ Production Association. He noted that production decrease on the plant amounted to appr. 40%. For 10 years of launching activities (since March 1999) 30 launches have been conducted within the “Sea Launch” project (28 successful missions). The programâ€™s participating parties are: Yuzhmash Machine-Building Plant and Yuzhnoye State Design Office, Boeing Commercial Space Company (USA), Energiya Rocket and Space Corporation (Russia) and Akar ASA (Norway). PRIME-TASS. In 2009, Ukraine has allocated $6.8 million USD for development of the multi-purpose tactical rocket system “Sapsan”. This figure was announced by NSAU Director General Dr. Yuriy Alekseyev at todayâ€™s press conference. “In 2009, SDO Yuzhnoye passed the preliminary design defense. â€œThis year we have to start the design phase,” said Yuriy Alekseyev. According to him the main issue today is the adoption by the Government of the program on this system development that will allow providing funds for this project in a separate line of the state budget. The Head of NSAU mentioned the discussion with the Ministry of Defense of Ukraine, which supported the need for such weapon systems. “If we start our work today, I believe we move to the flight tests in 2.5-3 years”, – said Dr. Alekseyev. Under his estimation, development of such system would require about 3.5 billion UAH/almost $ 450 million. For comparison, he mentioned the Russian Eskander system worth $ 1 billion. Task complexes being currently on service in Ukraine, will expend their operational resources in 2015-2016. The decision to create a rocket system “Sapsan” was taken by the National Security and Defense Council in 2006 with the active support of the President Viktor Yushchenko. Financing of development began in 2007 in the amount of $12 million dollars. New operational and tactical missile was planned to be put into service in the Army and Navy after 2011. Range of the rocket will not exceed 280 km. RBK-Ukraine. The Intergovernmental subcommittee on space was opened in Moscow. It was noted by Director General of the National Space Agency of Ukraine â€“ Mr. Yuriy Alekseev at the press conference. “Representatives of the NSAU, SDO Yuzhnoye and Kharkiv NDIRV flew to Moscow to participate in the Subcommittee. The Russian Party will be headed by Viktor Remishevsky, Deputy Head of the Federal Space Agency of Russia. Ukrainian Party pointed out 4 major issues. â€œThe first one â€“ possibilities to accelerate signing of the agreement on GLONASS. 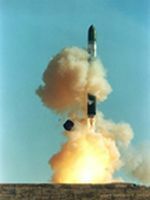 The second issue â€“ ratification by the Russian Parliament of the Agreement on missile technology transfer. 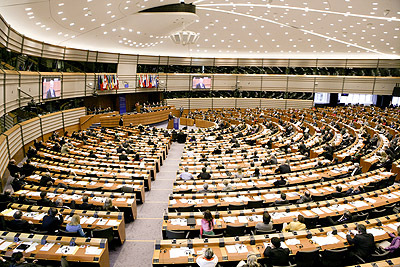 The third issue â€“ preparation of the documents on intellectual property protection. And the 4th issue â€“ joint support of the “Dnipro” program,” said Yuriy Alekseyev. He noted that the subcommittee session foresaw discussion of a wide range of issues, but these 4 items would be brought for discussion by Ukrainian-Russian Intergovernmental Committee, to be held on the top-level in Moscow, April 22. 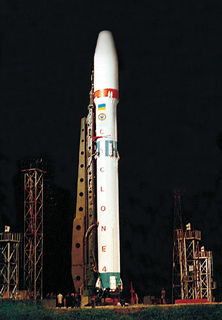 Ukraine’s Cyclone-4 satellite launcher will lift off from Brazil’s Alcantara spaceport beginning in 2012. Construction work on the ground complex begins this year. At present, intensive works are carried out in vegetation clearing of the 500 ha area, where the space rocket system will be deployed. Parabolic Arc has the full story here. 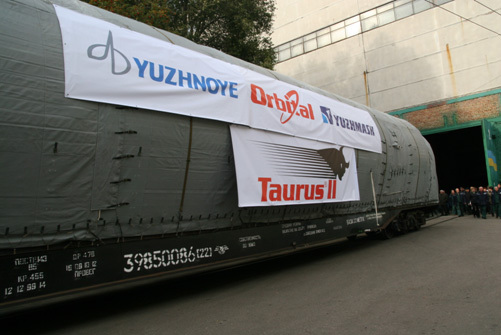 The Yuzhnoye State Design Office has just shipped the first stage of the Taurus II rocket to the United States. The rocket is being built to launch satellites into orbit and supply ships to the International Space Station. Parabolic Arc has the full story here. May 17, 2010. In course of the official visit to Ukraine of the President of Russian Federation D. Medvedev the Agreement between the Cabinet of Ministers of Ukraine and the Government of Russian Federation on cooperation in utilization and development of Russian global navigation satellite system GLONASSS was signed. From Ukraine the Agreement was signed by Director General of the National Space Agency of Ukraine Mr. Yuriy Alekseyev, from Russia â€“ by Head of the Federal Space Agency of RF, Mr. Anatoliy Perminov. The authorized body in charge of effecting cooperation foreseen by this Agreement from Ukraine shall be the National Space Agency of Ukraine, from Russian Federation â€“ Federal Space Agency and Ministry of Defense of Russian Federation. Goal of signing the Agreement is in establishing an appropriate organization and legal basis for mutually beneficial collaboration in utilization and development of GLONASS system. designing of the navigation consumers hardware, which shall be operated within standard precision signals of GLONASS system, other navigational satellite systems and their functional supplements. During the validation period of this Agreement Russian Party shall provide Ukrainian Party with access to the standard precision signals of GLONASS on continuous, global and unlimited basis in compliance with the current capabilities of GLONASS system. Ukrainian satellite system of the functional supplement to GLONASS and Ukrainian ground infrastructure of GLONASS shall remain under jurisdiction and control of Ukraine. The signed Agreement allows Ukrainian and Russian enterprises to conclude foreign economic agreements on providing the works in the satellite navigation area, conditions for creation of additional workplace in Ukraine and also promotion of Ukrainian enterprises at the global market of the satellite navigation services and technologies. Russian research space station â€œFobos-Gruntâ€ [Phobos-Grunt] planned to be launched in November 2011 will be controlled during the flight by the specialists of Ukrainian National Space Facilities Control and Test Center (NSFCTC), located on the West of Crimea near the city of Yevpatoriya,Â said Deputy Chief of the Center, Mr. Sergiy Gusev in course of his press-conference in Simferopol. “Russian party approved the decision that the best reasonable should be the scheme of control over the object from Yevpatoriya. Currently, weâ€™re actively preparing for the launch in cooperation with Russian enterprises,”Â said Mr. Gusev. â€Fobos-Gruntâ€ project foresees delivery of the probe to the Martian satellite Fobos, landing of the automated craft on the surface of the satellite, taking of soil samples and their delivery back to Earth. 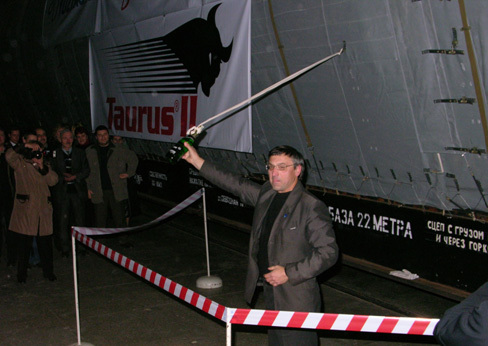 Initially, the launch of â€œFobos-Gruntâ€ was planned for autumn 2009, but due to the necessity of additional tests was postponed. The National Space Facilities Control and Test Center, which is affiliated to the National Space Agency of Ukraine, celebrates its 50th Anniversary in June current year. It started its activities in June 1960 as a Center for Deep Space Communication. Russia will provide its assistance in upgrade efforts for Ukrainian telescope RT-70, Roscosmos Head Anatoly Perminov told news media after the meeting of the Committee on Economic Cooperation of the Russian-Ukrainian Interstate Commission. “We decided to take part in modification of this telescope for further exploration of distant space,” Roscosmos Head said, adding that the first batch of Russian equipment has been shipped to Evpatoria already. The telescope may be used during Russian space mission to Phobos. Ukrainian-Kazakstani negotiations were held under the supervision of the President of Ukraine Viktor Yanukovych and the President of Kazakhstan Nursultan Nazarbayev. President of Ukraine Viktor Yanukovych and President of Kazakhstan Nursultan Nazarbayev signed the Protocol on introduction of amendments and additions to the Plan of Actions Ukraine-Kazakhstan for 2010-2011.
â€œI believe, we should renew a number of joint fundamental research in the field of space, and obviously use our joint capabilities,â€Â specified Viktor Yanukovych, recollecting that Ukrainian launch vehicles remained some of the best worldwide. â€œWeâ€™ll propose you to work out this Plan,”Â said the President of Ukraine. In the presence of Heads of states the signing ceremony was held for a number of bilateral documents, aimed at extension of Ukrainian-Kazakstani cooperation which included the Plan of Cooperation in the field of space for 2010-2011 between the National Space Agencies of Ukraine and Kazakhstan. preparation, advance training and space personnel development. On Sep.2, 2010, the signing ceremony for bilateral documents took place in course of the state visit of the President of Ukraine Viktor Yanukovych to China. After this 13 bilateral documents have been signed in the presence of two state leaders, including the Program of Ukrainian-Chinese cooperation in the exploration and peaceful use of outer space for 201-2015. The Program included over 50 joint projects divided into 2 parts: Primary and Perspective projects. In particular, it was foreseen to develop joint space system for Earth observation, implementation of ionosphere satellite project for creation of the earthquake forecasting system, development and supply for Chinese partners of diverse rocketry equipment and instrumentation. The Program was signed by Director General of the National Space Agency of Ukraine (NSAU) Mr. Yuriy Alekseyev on behalf of Ukraine and Administrator of Chinese National Space Administration (CNSA) Mr. Chen Qiufa on behalf of China. Informational Day dedicated to participation of Ukrainian scientists in the 7th Framework program of EU (FP-7) for scientific research and technological development was held in Yevpatoriya in the framework of the 10th Ukrainian conference for space research under participation of the National Space Agency of Ukraine jointly with Space Research Institute NASU-NSAU and Joint Support Office for Integration of Ukraine into European Research Area (JSO-ERA). The main goal of this event was to get the scientific audience of Ukrainian space industry and the National Academy of Sciences of Ukraine acquainted with terms & requirements of the new FP7 Call (Call 4) and hold practical consultations on preparations of proposals. Adviser of NSAU Director General Mr. E. Kuznetsov opened the event and welcomed its participants. He underlined that the dialogue and collaboration between EU and Ukraine in the field of science and technology was extremely important background of the international scientific and technical cooperation of Ukraine. It was stressed that currently NSAU and scientific institutions of space industry had some experience in organization of activities within FP-7 program. Nevertheless, such activities could not be efficient and long-lasting without concluding of direct working ties with the European colleagues. Sergiy Gerasymchuk â€“ Thematic expert, EU project JSO-ERA. Representatives of scientific institutions and space industry enterprises also took an active part in the Informational Day, among them: SDO Yuzhnoye, SE Yuzhmash, UrkETRI, ITM, IMRTI, RMRI, SRI, Elmiz etc. During presentations Ukrainian audience was provided with all necessary information concerning participation in new Call in the area of â€œSpaceâ€. In their reports European and Ukrainian speakers informed the audience about successful projects within FP-7 program, applied during the last year Call and analyzed their disadvantages. Ukrainian participants were given time within the Informational Day to arrange discussions with European experts concerning already prepared preliminary proposals and analyze the opportunity of engagement in consortiums with potential European partners. Saudi Arabia and Ukraine have signed, in Riyadh today, an agreement aiming at cooperation in fields of research and peaceful space exploration in the way that boosts social, economic and cultural development in both countries. The agreement that was signed, for the kingdom, by Dr. Mohammed Ibrahim Al-Suwaiyel, KACST President and for Ukraine. by Yuriy Alekseyev, Director General of the National Space Agency of Ukraine,Â stipulates that Saudi Arabian and Ukrainian scientists will cooperate in fundamental space research and a range of applied sciences, particularly remote-sensing and geophysics. The agreement offers broad opportunities for scientists from the both countries in fields of training, scientific, engineering and technical sharing, developing industrial and commercial programs in fields of research as well as holding joint symposia, conferences and other joint scientific meetings. Dr. Al-Suwaiyel stressed the important of this agreement with the Republic of Ukraine as it opens fields of expertise exchange with one of the states that have advanced experience in fields of space research, meanwhile, emphasizing the keen interest of the Government of the Custodian of the Two Holy Mosques to open scopes of scientific cooperation with all scientifically- advanced countries according to what is stated in the Comprehensive National Plan for Science, Technology and Innovation. From his part, the Director General of the National Space Agency of Ukraine expressed his pleasure with this scientific cooperation with the Kingdom of Saudi Arabia that has achieved over the last years giant leaps in space exploration that witnesses tough scientific competition, lauding, meanwhile, the scientific accomplishment achieved by the kingdom in this field. Prince Dr. Turki Saud Mohammad Al Saud, KACST Vice President for Research Institutes indicated that KACST has developed and implemented the Kingdomâ€™s National Plan for Science and Technology in cooperation with various stakeholders in the government and the private sector. The delegation of Japan visited Ukraine on June 2, in order to hold bilateral negotiations on implementation of the joint projects in the field of ERS micro satellites development and extension of the other areas of scientific and technical cooperation between Ukraine and Japan in space area. During the visit Japanese delegation made a presentation to NSAU on activities of the University of Tokyo in the field of nano-satellites development and expressed an interest in joint projects implementation. In course of negotiations the delegates emphasized that joint design and operation of micro/nano satellites is a perspective area to extend Japanese-Ukrainian collaboration in the field of space activities. The parties supported a decision to work out the capability of granting the project of ERS nano-satellite development a status of official Ukrainian-Japanese project. To that end the Parties agreed to conduct measures on preparing an appropriate Agreement and its signing during Aviasvit 2010 Aerospace Salon. An arrangement was reached that Ukrainian Party should consider the possibility to extend the list of Ukrainian participants of the project (NTUU KPI, ISR NASU-NSAU, NSYEC), and also the possibility of elaboration/execution of an educational program with mutual students exchange and experts training courses. Holding of consultations with Ukrainian experts on the technical parameters of sensors for the ERS nano-satellite is also foreseen. Japanese delegation also visited NTUU KPI, Kyiv. The Protocol of negotiations was signed on the achieved results of the meeting.